Our sports design is perfect for the kid involved in many different sports. The background of this design have a football, a soccer ball, a basket ball and a baseball along with other graphics for these sports. The background color is your choice - we chose white. We also chose a ribbon with stitching, along with a large round label featuring a baseball player with this name for the personalization under the graphics. We also chose an olive green color to coordinate with the background. The baseball player's uniform is re-color-able - so you can use your team's colors. You can also change the hair, skin and eye color on the baseball player graphic. As with all of our designs, you have the choice to customize the design and see the changes live in our customization system. You have the option of choosing the background, ribbon, the label, the graphic, the personalization and of course the color. 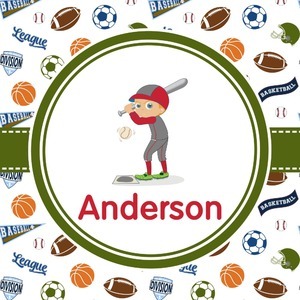 If you child only plays one sport - we have other backgrounds or you can create your own background with one of the many graphical elements in our design system. We have a choice of players i.e. baseball, basketball, soccer and football - and you can customize their uniforms to your team colors.